Diarmuid is the author of four social educational resources for both primary and secondary schools including the best-selling novel “Im Happy Now.Com”. His teaching resources primarily focus on the topics of bullying and wellbeing and is a regular speaker at events on social educational matters. He is a former Headhunter in the City of London, in the Corporate Mergers & Acquisitions markets, specializing in behavioural analysis. 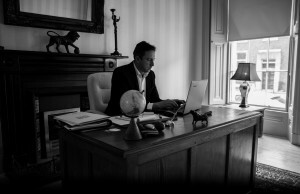 In his spare time, Diarmuid’s interests include Georgian architecture and collecting antiques.